Canon’s newly-released imageCLASS MF730 series (colour), MF525 and MF420 series (b&w) devices have just raised the bar for low-cost, feature-rich multifunctions. 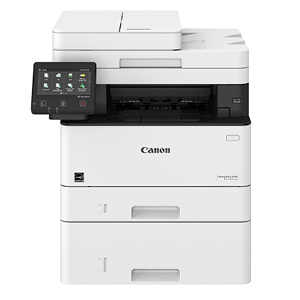 While other manufacturers offer Single-Pass document feeders on their high end desktop devices (priced $2000 and up), Canon has put them on their entry-level MFPs. Single pass document feeders read both sides of double sided documents at once when copying and scanning, instead of feeding the sheets back in and flipping them. This not only greatly increases the speed of scanning large documents, but also cuts down significantly on paper jams caused by wrinkled and torn originals. Canon has also put a large, full colour touch screen with intuitive, easy-to-use options on their imageCLASS MFP’s, while some other manufacturers still use small 2 or 3 line LCD screens and manual up/down buttons on devices in the same class. The new imageCLASS 730 series and 420 series devices are perfect for offices that need to do higher volume scanning than was previously possible on small, low-cost devices, but don’t print enough to justify the cost of the more robust, higher volume, higher cost MFP’s like the imageCLASS 9220. Service agreements available on most models, with Canon OEM toner for 4 year terms. Service agreements with Revolution compatible toner available for the 730 series colour devices for 3 year terms. Great for medium print volume offices, the MF 730 series comes with the same great features and options as the MF 429 monochrome series, but with bright, sharp colour images. The Single Pass 50-sheet document feeder is available on the MF 735 and 733, and the MF735 can print on cardstock up to 80lb Cover (225gsm)! Service agreements available with OEM toner (4 year terms) and Revolution compatible toner (3 year terms). These compact colour MFPs have more features built-in than you would expect from low-cost devices. The MF 634 comes with a Single Pass 50-sheet document feeder, and the large colour touch screen offers superior functionality and ease of use. Devices can be customized with extra paper trays and other options. Contact us for details and pricing. Best for higher volume workgroups or offices where you need something a little more robust. The MF 9220 can be customized with extra paper trays, comes with built-in fax capability, and has an easy-to-use colour touch screen. Service agreements available with Canon OEM toner (4 year terms). The highly awarded imageCLASS MF 525dw is an exceptional small/medium workgroup device with media handling up to 199 gsm (110lb Index) and a lower cost of printing than the MF420 Series. The built-in 50-sheet Single Pass document feeder makes scanning double sided originals fast and reliable. Comes with fax, and configurable with multiple extra paper trays. These versatile, compact devices are fast, low cost, and easy to use. All come with a built-in Single Pass 50-sheet document feeder, a feature virtually unheard of in desktop devices! The large colour touch screen is intuitive and offers features normally reserved for bigger, more costly devices.